Until now, my flour tortillas have always come out of a plastic bag. I had no idea how easy it was to make them at home! Four ingredients plus a little time, and you’ve got tasty homemade tortillas. We really enjoyed these and I will definitely be making them again! You’re supposed to cook them in a cast-iron pan, but I don’t have one, so I used a nonstick pan. It worked fine. We eat a lot of Mexican food, often chicken tacos that I make using Penzey’s Taco Seasoning. They make several types of taco seasoning, but I like their basic Taco Seasoning best. The tacos were extra-good with the homemade tortillas! Thanks go to Michele for suggesting that we make these. We both have a copy of Flatbreads and Flavors, which is a great cookbook with tons of recipes from around the world, including this one for Wheat-Flour Tortillas on page 395. Be sure to check Michele’s blog to see what she thought of this recipe. I used unbleached all-purpose flour. The book explains that hard flour is also known as bread flour, which has a higher protein content. I have bread flour, so I don’t know why I didn’t use it! But these were great with all-purpose flour. The recipe says that while one tortilla is cooking, roll out the next one. I had a couple that were close to burning, so you may want to do one thing at a time, at least until you get the hang of it. Saving a few minutes isn’t worth losing a few tortillas. I rolled out and cooked four of the tortillas one night. I wrapped the other four unrolled pieces of dough in plastic and put them in the refrigerator. The next day, I took them out and set them on the counter for about 30 minutes, then rolled and cooked. They were just as good as the day before. Equipment: medium bowl, cast-iron or other heavy griddle or skillet at least 8 inches in diameter, rolling pin. Combine the flour and salt in the bowl. Sprinkle the corn oil over the flour mixture and blend it in thoroughly. Gradually add 1/2 cup warm water, stirring with a fork to moisten the dough evenly. If it is too dry to gather into a dough that will hold together, add a little more water. Gather the dough into a ball, turn out on to a work surface, and knead briefly. The dough should be easy to knead but not particularly wet or dry. Divide the dough into 8 equal pieces. Flatten each into a disc about 3 inches in diameter. Cover with plastic wrap and let rest 30 minutes. Heat the griddle or skillet over medium-high heat until very hot. 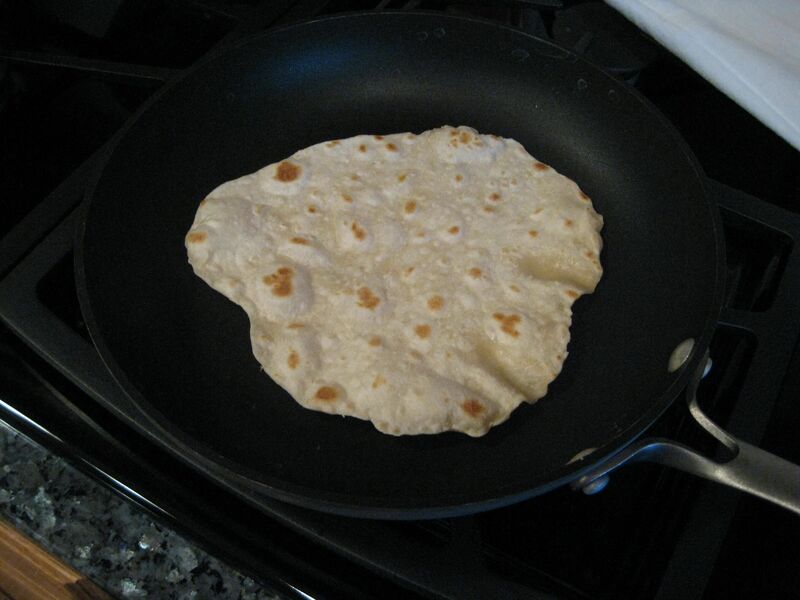 On a lightly floured surface, roll one tortilla to 7 – 8 inches in diameter. Place it on the griddle – if it is hot enough, the first side should become speckled with brown in about 45 seconds. Turn it over and cook for another 45 seconds. Wrap warm tortillas in a kitchen towel. As each tortilla is cooking, you can roll out the next one. As they cook, stack them and keep them wrapped in the towel. Tortilla dough can be stored in the refrigerator for up to a week, wrapped in plastic or sealed in a plastic bag. Before rolling, let the dough come to room temperature. You can wrap leftover tortillas in plastic and freeze them. Reheat on a hot dry skillet for about 30 seconds, flipping over halfway through. Reheat only as you need them, because they toughen quickly. Your tortillas look wonderful Jill! I just made some last week too and you reminded me I stuck them in the freezer so I could make tacos this week – yay! Your tortillas look delicious and I’m so glad that you enjoyed them. It’s always so fun to bake with you! Great stuff. I have not made tortillas in a while, so I appreciate the reminder. Using half whole wheat flour usually works well, too, but I have yet to try all whole wheat. I’m glad you mentioned that you can refrigerate some until the next day. I will have to try this! Thanks. These look great, Jill! I will have to make some. Those packaged ones sit so long, they are often stale before you get them home. Thanks for the recipe. 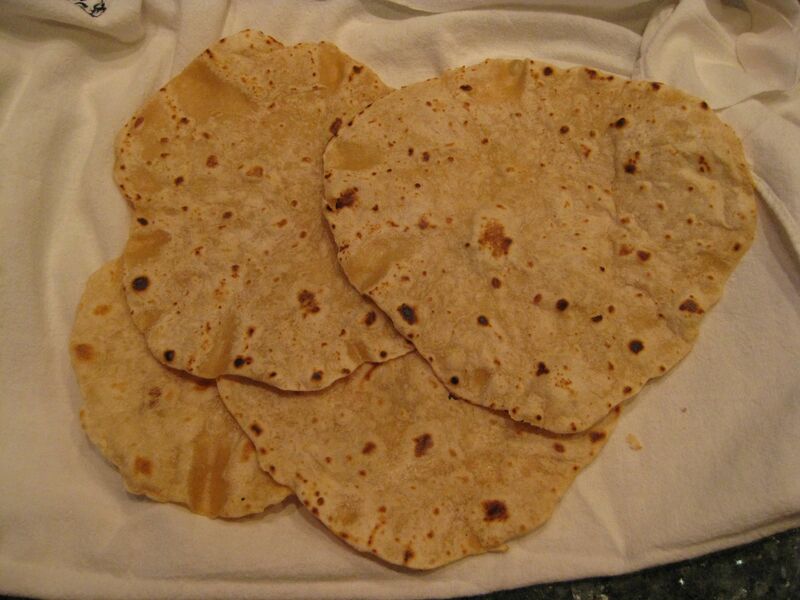 What a great idea to made homemade tortillas. They look delicious, and not overly difficult! I’ve always wanted to make my own tortillas-these look fabulous! So good to know that it’s so easy!!! I subscribe most often to the one thing at a time philosophy when it comes to these…they cook quickly! Yours look wonderful. Corn tortillas are easy to make as well…have you tried those? And best part…they are so inexpensive to make at home! I haven’t tried corn tortillas, but I would love to! I’m just like you – I thought tortillas came out of a packet. These look great! Ooh, those would be fun to make. I’m not big on the store bought ones anyway. I love that there’s just a little bit of corn oil, not lard or shortening. I just bought some of the Penzey’s Taco Seasoning but haven’t tried it yet. Now I can’t wait. And your tortillas look wonderful. All I would need is a little Nutella.